Jose Mourinho has reportedly lost faith and is willing to let some of his misfiring stars go in January! Manchester United have had a difficult 2017-18 season so far, trailing Premier League leaders Manchester City by a near-insurmountable margin, getting knocked out of the EFL Cup by Bristol City and it seems that manager Jose Mourinho’s patience is wearing thin with his squad. When Manchester United made Luke Shaw the world’s most expensive teenager of all time in 2014 (a record since broken) after paying Southampton £30 million to secure his services, it’s safe to assume expectations were sky-high. Unfortunately, neither Louis van Gaal nor his one-time protege—and current United incumbent —Jose Mourinho seem to have figured out a way to keep the left-back fit for the past three seasons and counting. Fit being the key word, for whenever has played, the Saints Academy graduate has been impressive. However, he hasn’t played much. In fact he’s hardly played at all. Take in this remarkable statistic regarding the 6’1 fullback: In two seasons, Shaw played more times for Southampton (60) than he has in three plus seasons for Manchester United (34) in the Premier League. To complicate matters further, Ashley Young’s been ripping it up of late and while Shaw’s started to see more playing time with Antonio Valencia injured, one senses the left-back has reached the end of his rope at United. Reports of a reunion with Mauricio Pochettino continue to swirl and a swap deal for the unsettled Danny Rose isn’t as implausible as it seems. Newcastle United are also in dire need of a left-back and if Shaw wants to make Gareth Southgate’s England squad for the 2018 FIFA World Cup, the 22-year-old needs to move to a club where the manager has faith in him and can give him regular minutes. Another high-profile signing that has failed to make the cut at Manchester United. Henrikh Mkhitaryan actually hasn’t been as bad as people make him out to be but his drastic loss of form after a blistering start to the current campaign has left many people scratching their heads. The Armenian took his time to find his feet in England after signing for a reported fee of £30 million from Borussia Dortmund last season, but his display at the turn of the year sparked hopes he could rekindle the form that made him one of the most feared players in the Bundesliga. Mkhitarayn began the 2017-18 campaign on a sensational note, but his performances soon dipped to such an extent that Mourinho left him out of matchday squads of late. He last started a game in the beginning of November and has played for a cumulative total of 73 minutes in the whole of December. Jose Mourinho has publicly claimed he’s not averse to selling his misfiring stars and while he may simply be trying the stick treatment in a bid to motivate his players, at this stage, anything is possible. Borussia Dortmund are interested but wary of the price tag United are likely to slap on the Armenian, while Inter Milan are likely to push for a loan move. If Arsenal lose a few players in the January transfer window, the Gunners may be tempted to make a late swoop for Mkhitaryan as well. Has Fellaini been unfairly treated during his time in England, as claimed by the lanky midfielder himself? The 30-year-old has been overly criticised by Manchester United fans, lampooned by the rest and it’s not surprising to hear he’s receptive of a move abroad. A one-man wrecking ball at his best, terribly clumsy and capable of getting sent off anytime at his worst, Fellaini’s time at United has been marred with incidents that have scuppered any chances he had of endearing himself to the United faithful. Sporting an iconic afro, the 6’4 midfielder was the marquee signing made by David Moyes and while he’s certainly fared better than the Scottish manager did at Old Trafford, that’s not saying much is it? Mourinho has repeatedly called on the fans to show him some love and while Fellaini acquitted himself well this season, especially when Paul Pogba was injured, it appears even the United management aren’t too keen on keeping him beyond the current season. Since his contract with United expires in 2018, the Belgian would be a free agent in the summer and eligible to sign a pre-contract with a club of his choice in January. To avoid that situation and in a bid to salvage as much of his £27 million fee they paid Everton, United may sell him in the winter transfer window. Ligue 1 giants Paris Saint-Germain are said to be keenly monitoring his situation, as are Turkish Super Lig team Besiktas. Despite never quite performing at the desired level for United, there seem to be no shortage of suitors for Fellaini and with a World Cup on the horizon, he may just move to a place where he’s a confirmed starter and appreciated. The only player in this list to have actually given a good account himself from day one is United’s No.2 keeper, Sergio Romero. Signed on free transfer in 2015, primarily as a backup to David de Gea, the Argentine has proven himself as a more than capable deputy whenever called upon. 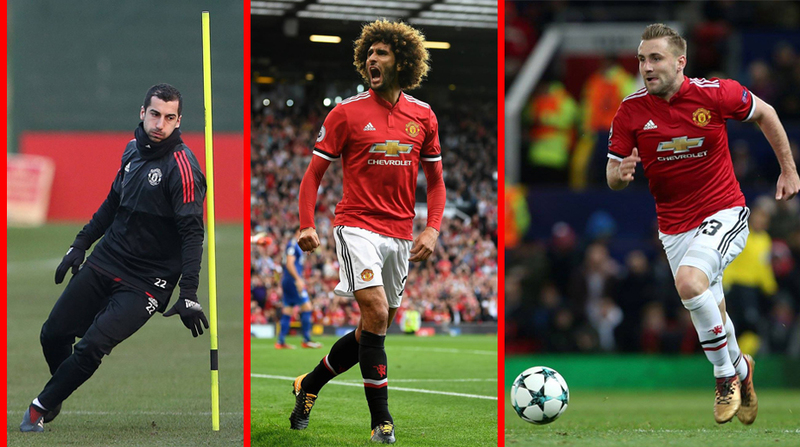 Must read: Who will be Manchester United’s next long-term captain? Last season, United were taking part in the UEFA Europa League and the fact that they reached the final (and won it) allowed Romero to get some matches under his belt, but this time around the Red Devils are playing in the UEFA Champions League and de Gea has been starting in Europe. Considering United were knocked out of the EFL Cup, Romero can only realistically hope of playing in FA Cup matches, since Premier League and Champions League games are reserved for de Gea. Unfortunately for Romero, who’s a proper keeper in his own right, he will forever be in the shadow of de Gea for the Spaniard is the best keeper in England, hands down. However, with 2018 being a World Cup year, Romero is reportedly worried he may miss out on Jorge Sampaoli’s squad due to his lack of game time and may push for a temporary move. The 30-year-old would walk into most Premier League’s starting XIs, but Jose Mourinho would be wary of strengthening a rival and is likely to try his best to block any potential move. A loan deal could be possible, but will the Special One relent? Matteo Darmian may not have cost United big bucks when he was acquired from Torino in 2015, but he’s most certainly been a flop. Louis van Gaal obviously saw something in him that Jose Mourinho doesn’t, for the versatile Italian has found playing time hard to come by ever since the Portuguese took over. Ashley Young, Antonio Valencia and Luke Shaw are all clearly above him in the pecking order at the moment and it’s highly unlikely that the scenario will change anytime soon. A move back to the Serie A seems the best possible option for all parties involved, with Napoli and Juventus tracking the 28-year-old for a while now. Not necessarily a bad player, just one of many who could not adjust to the pace of the Premier League and a move back to his homeland may just revitalise his flagging career. Considering Italy failed to qualify for the World Cup, there’s no real pressure on him to make a move as such, but why stick around at a place where you know you aren’t going to play?